The former head of security for Diosdado Cabello, president of Venezuela’s national assembly and vice-president of the ruling United Socialist Party (PSUV), is claiming Cabello is also head of a leading drug trafficking gang, the Cártel de los Soles (“The Suns’ Cartel”). The security officer is, Leamsy Salazar, that fled to the United States, and arrived in Washington on Monday, according to a translated article on InterAmerican Security Watch. The news has been broadly reported in Spanish-language media, and Spanish-language social networking sites have been buzzing over the development. Emil Blasco a Washington correspondent from Madrid’s Diario ABC sent a series of tweets on Jan. 26, stating that Salazar is seeking protection in the United States and will testify against Cabello, saying he is the kingpin of the Cártel de los Soles. He added that Salazar saw Cabello give orders to traffic drugs by boat, and has visited locations where Cabello saves “mountains” of cash. Salazar wasn’t just head of security for Cabello. He served as chief of security for former Venezuelan president Hugo Chávez for 10 years, and is being called the highest-ranking person to defect from Venezuela. Salazar allegedly arrived in the United States under the company of agents from the U.S. Drug Enforcement Agency (DEA). Bernardo Jurado, a former captain of the Venezuelan navy, told América Tevé of Miami’s Spanish-language TV show, A Mano Limpia, that the latest development would fit in with previous cases. Jurado said that Raúl Isaías Baduel, Venezuela’s ex-minister of Defense, who was sentenced to prison by Hugo Chavez, wrote a letter to the military elite saying their general Henry de Jesús Rangel Silva is also involved in narco-terrorism. In 2008, the US Department of the Treasury asked for Rangel Silva’s US accounts to be frozen on the charge that he had helped the FARC in narcotraffic activities. Baduel claimed the Venezuelan political elite are also partnered with the terrorist group Hezbollah in the drug trade. Hezbollah has an office in Venezuela. Jurado also said Venezuelan former judge Luis Velasquez Alvaray had claimed that Cabello also does money laundering for FARC, which has directly impacted the economy of Venezuela. Felix Jiménez, retired head of the DEA to NY and the Caribbean, explained also on the TV show, A Mano Limpia, that Venezuela has three main drug cartels. Its first cartel is The Sun’s Cartel, formed by its military which had a single sun emblem on their uniforms. The Suns’ Cartel was a nickname the cartel took on when drug trafficking operations spread throughout the military—an operation Cabello is allegedly in charge of. The two cartels are technically the same. The third cartel is the less influential Bolivarian Cartel. Jiménez said that in 1998, the United States signed an agreement with Colombia to fight narco-terrorism. The two main groups they were going after, at the time, were The Revolutionary Armed Forces of Colombia (FARC) and the National Liberation Army (ELN). In the late 1990’s, two Colombian cartels—the Medellin and Cali—were in decline. So when Colombia’s military started the offensive against FARC, the guerrillas fled across the border into Venezuela and assimilated the Medellin and Cali cartels, that previously had control of the region. FARC then invaded the Venezuelan territories of Apulia, Cura, and Táchira with the intention of taking hold of the port Cabello so they could more easily ship drugs to the United States and Europe. The Sun’s Cartel grew from the soldiers who were assigned to guard the FARC’s drug shipments, and since they were paid by the FARC with drugs instead of money, they got involved in the drug trade at national level forming the The Suns’ Cartel, which according Salazar is commanded by Cabello. Jiménez said “with the consent of former dictator Hugo Chavez,” the soldiers joined the drug trade and formed The Suns’ Cartel. The plural use of “sun” is meant to symbolize the whole military getting involved in the drug market. 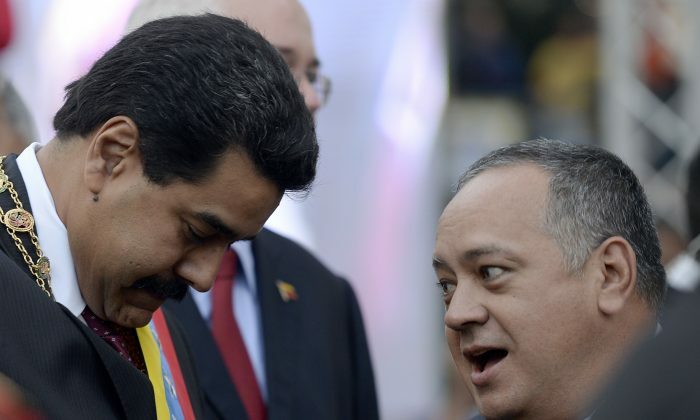 If Salazar’s claims are true, it means that one of Venezuela’s most powerful officials, Diosdado Cabello, is also Venezuela’s pillar of corruption and responsible for strengthening ties with terrorist groups such as Hezbollah and FARC.